California Governor Arnold Schwarzenegger will address Solar Power 2006 at (high) Noon on Thursday, October 19, 2006. Equal time will be given to his Democratic gubernatorial opponent, Phil Angelides. 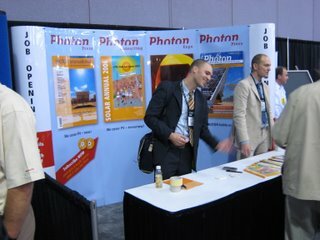 Here is a photo of the PHOTON International stand in full swing. Unfortunately, complimentary copies of the magazine did not clear customs and get delivered before the exhibition closed Wednesday afternoon.